Double din head units are more desirable than the smaller single din head unit as you will more than likely have a bigger display. This means the stereo will have extra features, look more aesthetically pleasing and add additional value to the car. The best double din head unit is the Touchscreen Pioneer AVH4200NEX System with a motorized display, built-in Bluetooth and many other features. Most aftermarket double din stereos have an elegant LED display to control the system. OEM double din head units can be rather dull looking with no touchscreen display, additional functionality and generally not enjoyable to use. Desirable double din stereos have features such as Bluetooth, USB, AUX, SD, DVD, WiFi, touch screen, reversing camera, navigation and much more. The latest double din systems are becoming mini computers located within your cars cockpit. If you are wanting to take your audio to the next level, an upgraded stereo is a major requirement. They allow for additional outputs, channels and other factors that help improve sound quality. OEM head units struggle to accommodate other speaker configurations, which can be a problem when installing additional speakers. Stereo brands are releasing new head units multiple times a year and we are dedicated to bring the latest that they have to offer. Below is a list of the best double din head units that include a range of functionality and the latest technology. The Pioneer brand are market leaders in the double din stereo category with head units available for a range of budgets. The AVH4200NEX is a premium stereo that includes an internal amplifier with 14 watts RMS and 50 watts x 4 channels. For those that do not have a Bluetooth car kit installed, the AVH4200NEX has you covered with built-in Bluetooth. Not only does it allow hands free calling for two phones but it will also allow for wireless audio streaming. The only drawback of the AVH4200NEX is that it doesn’t have navigation. 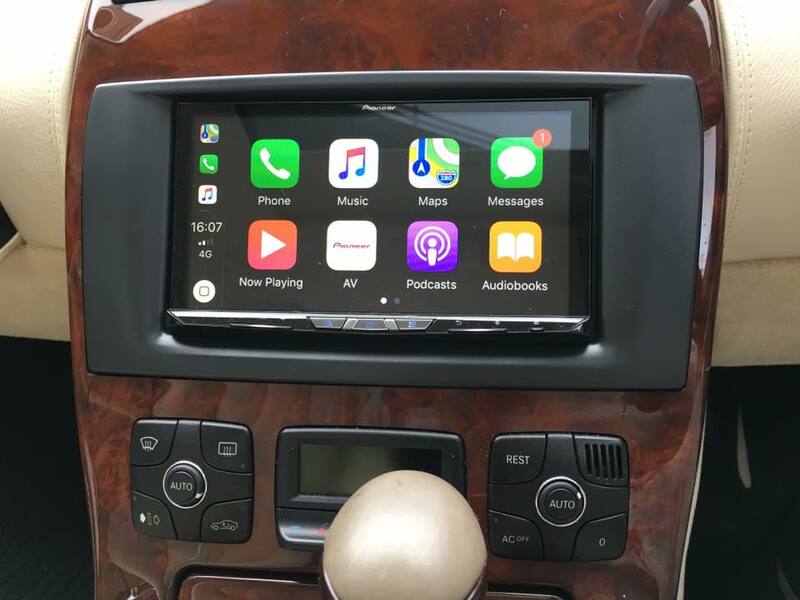 However, you could opt for the more expensive AVIC-8200NEX Navigation Receiver model or use your smartphone to display the maps via Apple Carplay or Android Auto. 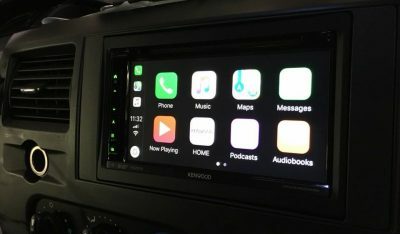 Overall, the Pioneer AVH4200NEX is the best double din head unit for the money with excellent Bluetooth connectivity and all the latest technology. Pioneer is an audio brand you can rely on for build quality and plenty of documentation for peace of mind. Alpine are a premium audio brand and the ILX-107 is the most expensive double din stereo within this article. It is not just overpriced, the features and build quality is excellent and unlike many of the alternatives, it does have navigation. The Alpine ILX-107 double din head unit is very much targeted towards Apple products such as the iPhone. 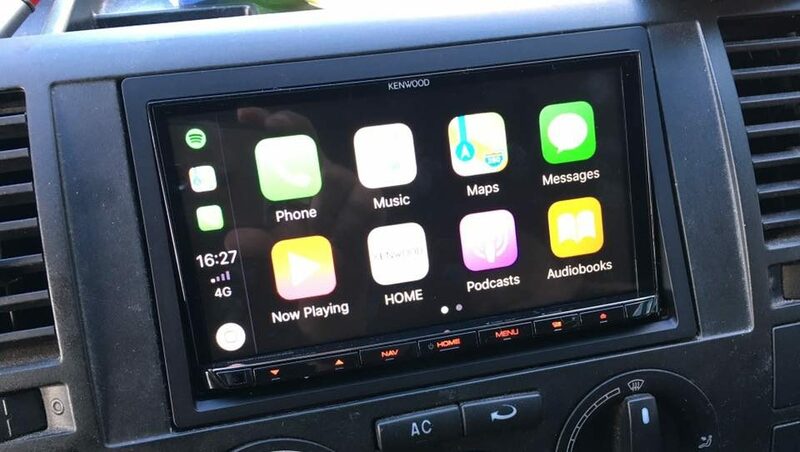 Software included such as Apple CarPlay can run via wireless connection and is very easy to use once you start getting used to it. Excluding the expensive price, as a premium double din stereo, it is a great all rounder with both the looks and features. If you have an Android smartphone, you may want to choose an alternative as this stereo only has Apple Carplay. Sony is one of the biggest brands in the world and their audio technology is highly reputable. In terms of car stereos, Sony wouldn’t be the first “go to” unit you would pick but the XAV-AX100 is highly popular and provides excellent compatibility with both Android and Apple smartphones. The touchscreen is 6.4 inches in size with responsive touch controls to use functions from the navigation, music playlists, phone calls and much more. It is also the only double din with a rotary dial, which is a very nice touch. The Sony brand is one that you can trust and although you pay a premium price, it is worth the extra. Not only is it compatible with both Apple and Android smartphones, it also provide a range of unique features that are not available with the alternatives. Sony have also gone to great lengths to ensure that you can achieve the best sound quality too. Pioneer is one of the leading brands when it comes to a double din head unit but the majority come with an expensive price tag. However, the Pioneer AVH-290BT is an affordable model that the brand offer. With a stylish 6.2 inch LED display, the Pioneer AVH-290BT is a fully touch screen head unit with many features. The design of this particular double din stereo is in accordance to those of premium car manufacturer cars but at a tenth of the price. For those that are on a budget, this double din head unit is the best affordable option that comes from the Pioneer brand. The 6.2 inch touchscreen and other features make it a great replacement for older OEM stereos. The Corehan Android operated double din head unit has a large 6.95 inch LCD display and offer the most amount of functionality. The sleek design of this stereo is very similar to a tablet, which will look great in the majority of cars. One of the most unique features offered is the ability to connect an OBD2 scanner. This allows you to monitor the performance of your vehicle at anytime, which is displayed upon the screen. In terms of the visiual display, the 1080P LCD display with dual USB support makes watching movies in the car far more enjoyable. Overall, this Coreham unit is the best android double din stereo you can buy every feature you can expect to see already installed on the unit. Kenwood (who are owned by JVC) are known for providing high quality audio and this can be seen with numerous unique features. The DDX773BH is also one of the nicest looking double din stereos on the market today with its limited edge touchscreen display. As reversing cameras are becoming more popular, the need for double din head units to support them are required. This Kenwood stereo will automatically adjust the display to the reversing camera when the reverse gear is selected. The Kenwood ticks every box in terms of what a double din radio should offer. The only thing missing is navigation, but the ability to mirror your smartphone to the device and play the audio through the stereo is perfect. The Jensen VX7020 is a US made double din radio that is very popular across America and Canada. Although the display of the Jensen stereo is slightly smaller than the others, it provides more user friendly buttons on the left of the head unit. The Jensen VX7020 is a top rated double din head unit and there is not a lot that it cannot do. To increase your confidence of buying this head unit, Jensen offer a years warranty. Compared to premium double din head units with similar features, this VX7020 model provides excellent value for money. The car audio brand BOSS Audio targets the budget stereo category but that does not mean the head unit lacks features. The BV9362BI model even comes with a three year warranty for peace of mind, which no other cheap alternative provide. The 6.2 inch touch screen monitor is fairly responsive and the user interface is fairly intuitive with clear call to action buttons. Unlike the single din unit head unit by Boss, this model supports rear camera view which is automatic as well as support the buttons on your steering wheel. With the Boss BV9362B1 double din radio, you are able to add up to 3 amps for additional front, rear and subwoofers channels. It is one of the best affordable options and it will certainly give your vehicle a modern touch. Upgrading your factory double din stereo is an easy yet effective way of increasing the value of your car. Not only that, it will completely modernize an older car that uses an older style head unit and allow you to use features such as Apple Carplay and Android Auto. Replacing your head unit also allows you to install additional speakers via the extra channel outputs. There is a wide range of benefits for installing a new head unit and with the latest technology, they can completely transform your driving experience. To help you make an informed buying decision, we have produced the below buying guide regarding double din head units. One of the best features of the latest stereos available are the compatibility with your smartphone. If you use a smart device that uses the iOS operating system, you have Apple Carplay whereas Android users have Android Auto. Both have similar features and enable you to use many of the features of your smartphone upon the double din head unit. This include navigation, hands free calling, sending and receiving messages and so much more. Both Apple Carplay and Android Auto are premium features but its worth paying the extra due to the amount of additional functionality. Most OEM stereos will not have many output channels, which can make upgrading your audio system fairly difficult. Anything from powerful car subwoofers that require a specific channel for additional watts to multiple channels for additional car speakers. If you are planning to improve car audio in the near future, you will want to ensure that the stereo you purchase is capable with the additional outputs. With the larger screens that a double din head unit has, viewing video footage such as a DVD to a camera for reversing is highly desirable. Not every stereo has this functionality but some can automatically switch displays when the car is backing up. If you want this functionality in your double din head unit, you can use an aftermarket camera and connect it to your double din head unit. This will require some wiring and therefore we recommend investing in the best backup camera you can get your hands on so its a worth the effort of installing it. The Android operating system is a highly desirable operating system to use for double din stereos. The reasons for the popularity is because Android has an excellent UI, familiar to a lot of people and allows tech enthusiasts to modify certain areas and download new applications. Many include their own software, which is just as good but you will probably need a few days to get to grips with things. There are so many people that will damage their stereos fascia in order to remove their stereos. Anything from using knives down the side of the unit to jamming screwdrivers down the side and this is a big mistake due to the damage it causes. We advise that you do not try those methods and instead invest into a pair of radio keys. These simply slot into the standard gaps that all head units will have and allow you to pull it out safely. Depending upon your vehicle, you may need to remove interior parts to gain access in order to locate the radio keys into the slots. Not every vehicle will have the room to install a double din head unit, which mean that you will require a new fascia. As shown in the image above, the fascia is designed to fit into the designated area whilst provide adequate space for installing the aftermarket head unit. For those that plan on installing their double din stereo themselves, check out this tutorial for a helping hand. The average price for a double din stereo is around $250 but there are two ends to the scale. On the budget side of things, you can get excellent packages with all the features you would want. However, the length to which they will run smoothly could be debatable and loading speeds could begin to increase. As any audio enthusiasts would tell you, audio is an expensive game to get into. Double din stereos can easily run into the thousands and that is not before you start adding speakers and subwoofers. Due to the low cost of an iPad and other tablets, you could even install them instead of a new head unit. An iPad is able to do almost everything functionality of a stereo and even more by linking it to a 3G/4G network connection. Rather than using an iPad car mount, you can perform some alterations to the fascia that enables you to mount it appropriately. The popular Mighty Car Mods YouTube Channel did exactly this and the results looked great. Upgrading your head unit is a fairly simple modification that can make a huge difference. Older vehicle in particular can be instantly introduced to the latest technology that makes driving far more pleasurable and safer. For those that are upgrading their car audio, installing the best double din head unit is critical. The additional speakers will require specific channels in order to perform as expected as not every OEM stereo will be able to handle extra audio components. Big brands such as Pioneer, Alpine, Kenwood and others are the recommend source for head units. Although expensive, the quality of the head unit and functionality is worth paying the extra. Was this before Kenwood DDX9018DABS was released?